White to move and make a living group. Black to prevent that. 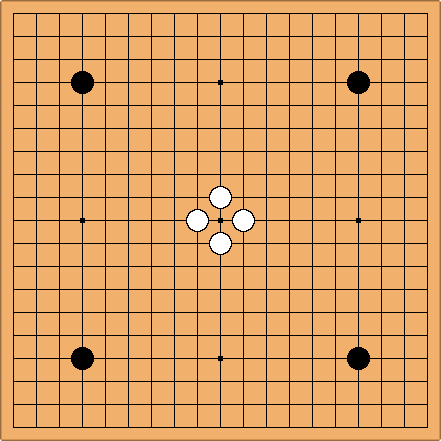 Black has to mind only about destroying white's shape, since his stones are connected by the marked stones at the sides anyway. Likewise, White has to care only about good shape: connect and make eyes. evpsych: Why one-point jumps all around? If I were White, I would try more than just good shape. 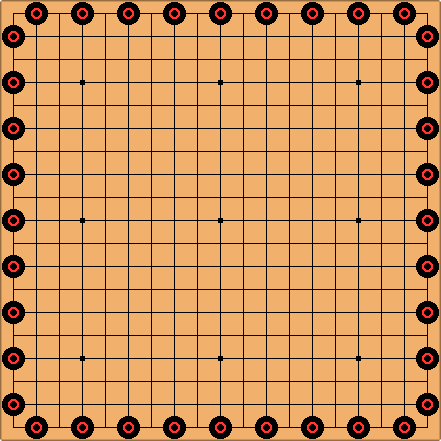 I would place two stones in dual-purpose moves on the second line such that the stones could form an eye on the inside, then ladder black around the edge of the board if Black fails to protect the edge. If Black protects, I would use the two stones on the inside. Tderz: I don't know the answer, but think it is a good exercise for beginners or weaker players. Hence, I will give this problem as an exercise in our Go-club (to beginners after the 8th lesson, having heard of the concepts of shape and being rudimentarily aware of life and death. Between equally ranked players in the weaker ranges (including me) everything might be possible. With a 9-rank difference, I guess the white player usually would win. If Black does not fill in, White can go between Black, and "chase" Black down the edge. Either way, White can make walls of at least this length along the four edges. After this, he can start sprinkling stones in the central area and has four places to flee to! I'm willing to take anyone up on this, because I feel very sure I could live (as White) against anyone! The method given by evpsych sounds like a desideratum (wish, e.g. free beer). I am equally interested in the fail- & fool-proof method to earn money on the stock market or in business. To play a multi-purpose move with one move is always desirable. I think the question still remains, how Black will/could/should answer. After all, Black is still connected to the right and left if tenuki-ing on the peep. If Black were to answer all the peeps, he would not die because of four connected "false" eyes securing a special life (double-headed dragon). Most probably your idea was that Black has answered all the peeps and the game starts anew with a (very weak) white row of ikken tobis, and White's sente. 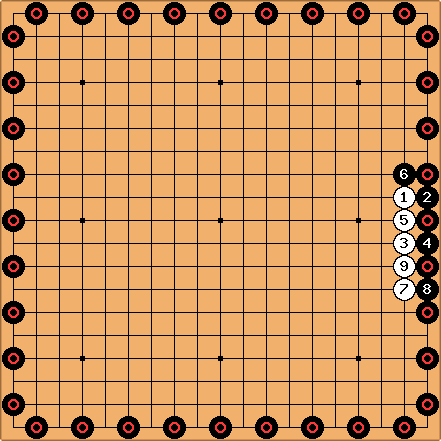 However, as mentioned above, it is only a question of time when Black whishes to refrain from connecting, perhaps even tenukiing the first two moves. One eye does not give life. Enough words , let's proof/test it. I have seen a comparable (?) setup before with a fully connected black wall (all stones on the first row). I do not remember anything special about the outcome anymore. It must have been a training exercise. George Caplan I have experimented with the variation referenced directly above, and my amatuer opinion was that White had to be a couple of stones stronger to live. However, I asked a pro once and he said White had to be a couple of stones weaker to die. The problem given here, should make it easier for White to live, that is correct. Alex Weldon: Except in very rare cases, I would not expect there to be much difference between having one-space jumps and having a solid wall around the edge. I've played the shape game many times (with the one-space jumps) and my experience is that if White has not made two eyes by the time she starts bumping into the edges of the board, she's going to lose anyway. Incidentally, I think this game is a very useful exercise for learning to handle unreasonable invasions late in the game. When I hear weaker players complaining that the opponent lived somewhere they shouldn't have been able to, it's usually because they were attacking his invasion as if it was reasonable to begin with - that is, trying to seal it in and make their own stones strong. When you are strong all around and the opponent has nowhere to run (such as in this game), you can focus only on preventing the opponent from making eyeshape. If a student tells me he often gets robbed in such situations, I recommend that he try playing this game a few times, in order to understand how such situations differ from the more balanced positions that usually result from reasonable play by both sides. Symplicity: I've played this several times in teaching situations, as both sides. Its a good exercise for learning how to poke out or form eyeshape in the center when one side is strong, and also how to play lightly. Acutally, I find it faster and easier to just play as if the 19x19 board was the interior of a 21x21 board where black has a solid wall all around the outside. It gives white slightly more space in the center, but that should hardly make a difference. That way, you don't have to set up black stones all around the border. In one version of the shape game, the game starts with one player placing some black stones on the (13x13) board. He may place as many stones he want to, and when he's done, the adversary choses if he wants to play White to live or Black to kill. So it's basically the shape game with the pie rule implemented. blubb: A similar but even (much) more distorted game setup can be found at Dots Go. This was mentioned in the DGS forums: here. I reversed the colors so that this shape can be achieved through normal play. tderz: Actually, why did White resign in the 2nd game (24010)? She simply could live 'somewhere' with a single capture move P10 on the right and perhaps by cutting at F5 ..ff on the left. Tas: A whole board problem simply can't be ko, since all the ko threats will be included in the problem. Could it be seki though? This is quite like the Killing Game; a variant for teaching overly defensive beginners to encourage them to attack. I have played this the opposite way: a stronger player took Black and I took white if I lived I won. I think the idea was to train a weak player to invade, and to break bad habits of drawing out games with trivial moves on the edge.